Part of a broader class of ‘absolute-risk strategies,’ low and adaptive volatility strategies are seeing substantial asset growth as investors recognize the value of downside protection and its impact on outcomes through market cycles. But history has been unkind to strategies that have attracted significant capital inflows, as the ‘crowd’ drives higher valuations and depletes capacity. 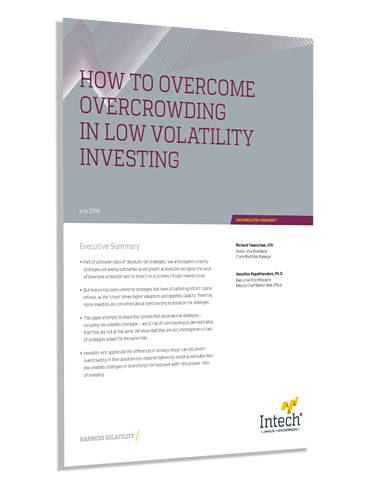 Therefore, many investors are concerned about overcrowding in absolute-risk strategies. This paper attempts to dispel the concern that absolute-risk strategies – including low volatility strategies – are at risk of overcrowding by demonstrating that they are not all the same. We show that they are not a homogeneous class of strategies subject to the same risks. By avoiding oversubscribed low volatility strategies or diversifying exposure among absolute-risk managers, investors can prudently access the benefits of this popular category while meeting the risk objectives of their overall portfolio.